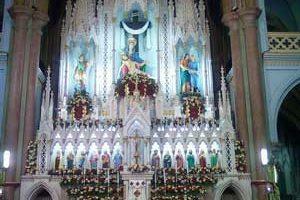 Shrine Basilica of Our Lady of Dolours Thrissur has got an area of 25000 sq. ft with three towers, two in front and one in rear. The front towers are having a height of 146 feet and the rear tower is having a height of 260 feet. The great Maharaja of Cochin, His Excellency Rama Varma issued the sanction to build a big church at Thrissur. He wished at that time tat” the New Church must be the biggest church in Asia” The wish of Maharaja was fulfilled in 1940 when the church was blessed by His Ex.Rt.Rev.Dr.Francis Vazhapilly. See top 15 Catholic shrines in the world. 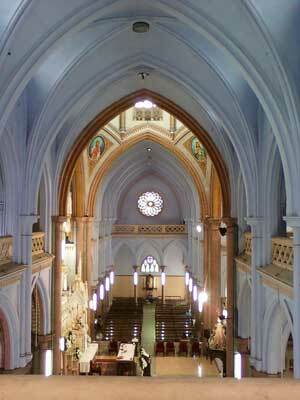 The New church was raised to the status of Minor Basilica on 25th April 1992 by the pope John Paul II. By this honour this church is made the model and example for all liturgical services and administration of sacraments. On Fridays and Sundays there are fire services in which the faithful are attending lively land actively. As a privilege the faithful is honoured by plenary indulgence by visiting and praying the following days in this Basilica. As a privilege to Basilica papal emblem and flag are placed in front of the main door of the church. Eight bells, imported from Germany is a specialty of this church. They are producing the seven musical notes. Every day morning and evening ‘Ave Maria’ will be toned together in the Angelus. Perpetual Adoration Center is a place of solace to the troubled man. Mar Joseph Kundukulam, the late Archbishop of Thrissur started this center and Cardinal Lourd Swamy inaugrated this. Everyday 8.15 a.m to 8.15 p.m there is adoration and Sacrament of confession is administrated from 8 a.m to 7 p.m.
As one enters the Church through the massive main door (elephant door) one notices the expansive nave that leads to the main altar. As he steps into the church and looks up, he finds, poised perpendicularly above him on the ceiling, the breath taking beautiful mural painting of the Holy Trinity. On both sides of the naves are a number of rock pillars wrapped in mosaic. Thousands can participate in the liturgy, occupying the nave, aisles, transepts and the balcony on both sides. The floor of the Church is paved with mosaic bricks and the whole church is gorgeously illuminated with varied varieties of electric lamps. The foundation stone of the Shrine Basilica of Our Lady of Dolours Thrissur is laid on 21st December, 1929 by His Excellency Mar Francis Vazhappilly, the Late Bishop of Thrissur. The church was blessed on 24th November, 1940. When they built the church they also built two bell towers in the front of the church in 140 feet and envisaged another bell tower in the back of the church in 260 feet. They could not build that bell tower in the back side of the church because of the lack of money. But it was the dream of the Catholics in Thrissur. The reconstruction of that bell tower started in 2002 when the present Auxiliary Bishop of Thrissur Mar Andrews Thazhath was the Rector of the Basilica. In 2004 when all the bishops of India were present here in Thrissur for the CBCI General Assembly held in Thrissur His Eminence Cardinal Daud Moosa blessed that Tower in the name Bible Tower. His Excellency Most Reverend Dr Pedro Lopez Quintana was also present for the function and dedicated the Bible tower for World Peace. The wooden door of the Bible Tower is in scripted with Bible words. 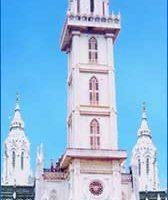 Renowned artists of the whole India have contributed their works in the Bible Tower. 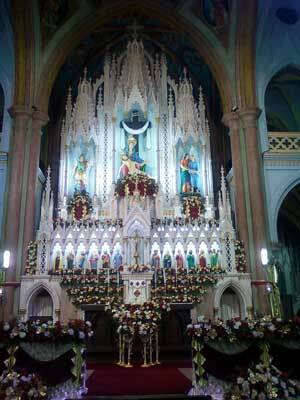 It is the first known Christian art gallery in Kerala. There is a view point at the top of the Bible Tower where we can enjoy the panorama of the town of Thrissur around 15 kilometers. There is a red cross on the top of the Bible Tower which can be seen from anywhere of the town represents the presence of the Catholics in Thrissur. The Commissioning of the Bible Tower marks the completion of the construction of the Shrine Basilica of Our Lady of Dolours started in 1925. It took 81 years for the completion. So December 3rd , 2006 is a historical moment. Thrissur City is well connected and serviced by rail to all major cities in India. Thrissur Railway Station is an major railway head in South India. Daily trains are avaliable to leading cities like Mumbai, New Delhi, Kolkata, Bangalore, Chennai, Mangalore and Hyderabad and almost every part of India. Kerala’s largest Railway Junction- Shornur Junction is just 33 Kms away from the city and is considered as Rail Gateway of Kerala, where all trains from and to Kerala touches. St. Thomas, one of the twelve chosen Disciples of Christ and the Apostle of India who sowed the seeds of Christianity in India, set foot at Cranganore (Kodungallur) in 52 AD. At that time Cranganore (Kodungallur) was a busy center of commerce and an important port. He traveled about various parts of Kerala by water and land, preaching the Gospel and forming Christian communities which began to grow and several of them sprang up in the vicinities of Thrissur Town too. The heart of the town, known for its spiritual and cultural heritage, was a dense forest in those days. 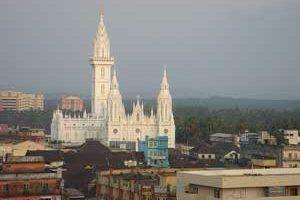 Shrine Basilica of Our Lady of Dolours Thrissur was got an area of 25000sq.ft with three towers, two in front and one in rear. The front towers are having a height of 146 feet and the rear tower is having a height of 260 feet. The great Maharaja of Cochin, His Excellency Rama Varma issued the sanction to build a big church at Thrissur. He wished at that time tat” the New Church must be the biggest church in Asia” The wish of Maharaja was fulfilled in 1940 when the church was blessed by His Ex.Rt.Rev.Dr.Francis Vazhapilly. Sakthan Thampuran, the great Maharaja of Cochin, paved the way for Urban Development and Commercial Progress of Trichur. As he understood keenly that the presence of Christians was quite essential for the development of the town where there were only a few Hindu families inhabiting, he took measures, around the year of 1794, for bringing and rehabilitating 52 Syrian Christian families from the neighboring centers of Aranattukara, Ollur and Kottekkad. He rendered all necessary help to these Christians. The option of the number 52 was as if to perpetuate the great Apostle’s arrival in Kerala. Since there was no Christian Church in the town, they had to go their parent churches to fulfill their spiritual needs. The Maharaja who perceived their difficulties, promptly permitted them to build a church. In 1814, His Ex. Dominicos, Archbishop and Governor of Cranganore (Kodungallur) Arch diocese, gave his approval and blessing to build the first Catholic church in the name of Our Lady of Dolours. 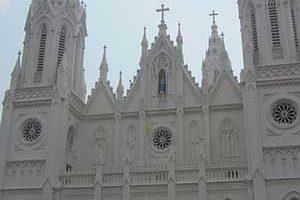 From 1814 to 1838, this church was under the jurisdiction of the Cranganore (Kodungallur) Archdiocese. On 24th April, 1838, H.H. Pope Gregory XVI issued a proclamation, “Multa Praeclara”, whereby the Cranganore (Kodungallur) diocese ceased to exist. 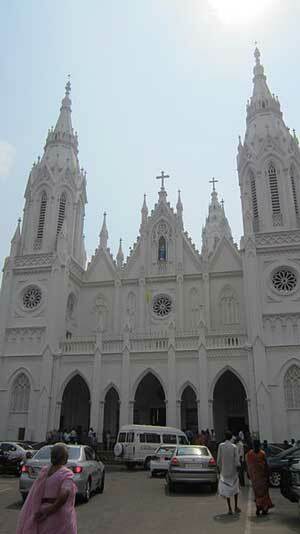 Consequently the Church of Our Lady of Dolours came under the authority of the Bishop of Verapoly which continued till 1861. Unfortunately, with the advent of the Persian Catholic Bishops Rocos and Melus, who came here without the necessary permission from the pope, there started differences among the Catholics of Trichur and its suburbs. The differences resulted in the so-called Rocos-and-Melus Schisms. Bishops Rocos and Melus had to go back owing to strong protest from the people in 1862 and 1882 respectively. In the year 1886 Pope Leo XIII suppressed the Archdiocese of Cranganore (Kodungallur) and in 1887 separated the Kerala Syrian Catholics from Verapoly and brought them under the Syro lMalabar Vicariates of Trichur and Kottayam. He appointed His Ex. Adolph Medleykot as the first Bishop of Trichur. In the fickle vagaries of history that followed, the Catholics lost possession of the Church of Our Lady of Dolours which they constructed in 1814. 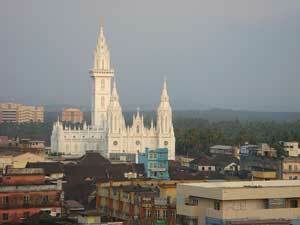 To compensate that loss, the Catholics of Trichur decided to build another church. Petitions seeking permission for this were sent to the Maharaja of Cochin, the Governor of Madras, the Viceroy and the British Emperor. Eventually on 8th October, 1925 , as per the order of H.H. Ramavarma Maharaja of Cochin, the Cochin Sarkar issued royal sanction to build a new church within the premises of the fort city of Trichur..
At sharp 10 a.m. on 10th October, 1925, His Ex. Bishop Vazhappilly Mar Francis blessed and offered Holy Mass on the altar built temporarily in the School hall which stood in front of the present church. 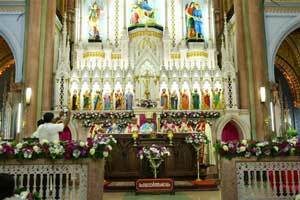 He named the Church as the church of Lady of Dolours Thrissur and Proclaimed St. Theresa of Infant Jesus (Little flower) as the Co-patroness. As the small temporary church was not spacious enough for the convenience of the believers, they tried to build a church conforming fully to their needs and grandeur of the town. His Ex Bishop Mar. Francis Vazhapilly visited Rome and European countries keenly observing the architecture of the churches there. The present church, known as the largest in Asia was built on the plan he drew on his return from abroad. On 21st December, 1929, His Ex. Bishop Mar Francis Vazhappilly laid the foundation of the colossal church. It took eleven years under the supervision of the famous Engineer Jnanaprakasam and the superintendent Ambros to almost complete the construction of the new church. On 18th September 1935 Sri. Ramavarma Thampuran, the Maharaja of Cochin, saw in person, the Progress in the building of the Church, and donated all the teak wood needed for building it. On 24th November, 1940 His Ex. Bishop Mar Francis Vazhappilly consecrated the Church. It was then under the jurisdiction of the Lourdes Cathedral Church. Considering the need of the time, Mar joseph Kundukulam constituted this famous shrine also as a parish on 17th September, 1978. It was made the headquarters of a forane division on August 1980. The historic visit of Pope John Paul II to Trichur on 7th February 1986 was within the environs of this parish. In commemoration of the centenary of the diocese of Trichur, His Eminence Simon D. Cardinal Lourdu Swami, head of the Congregation of the Oriental churches in Rome, inaugurated the Perpetual Adoration Center in this Church. 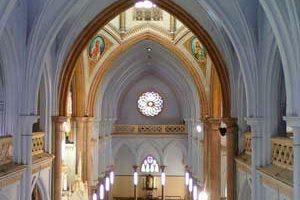 On 25th April 1992, His Holiness, Pope John Paul II issued a decree, elevating the church of Our Lady of Dolours Thrissur to the status of a “Minor Basilica”. 20th May 1992, was a monumental day in the history of this Church. His Eminence Cardinal Antony Padiyara consecrated the Church as a Basilica. There after the Church has come to be called” Basilica of Our Lady of Dolours”.